Ever since—at least—the classic James Dean-Dennis Hopper drag race in 1955's Rebel Without a Cause, souped-up sports cars have been part of the American folklore. But with Popular Mechanics, "souped up" means upgrading in bodywork, technology and "mechanical magic" (not necessarily speed), which has been the signature for the Hearst Magazines monthly's "Top Shop" advertising section since its 2003 start. 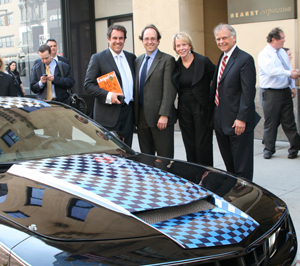 This time, it is the 2010 Chevy Camaro 1SS that gets the makeover (readers will see it in the May and June 2010 PM), and New York City pedestrians walking past Hearst Tower at 959 Eighth Avenue got a free viewing of Project Camaro on April 7.